Park Life is proud to present Close Wilderness, an exhibit of new paintings and drawings from Amze Emmons. The work in this exhibition tracks a research thread connecting, vernacular architecture, informal economies, and self-organized systems of community & exchange, essentially the intersection of Système D and material culture. Emmons finds something inherently hopeful embodied in these improvised solutions, spaces, and markets. He is inspired by walking the cities, photo-cataloging aspects of street life. In particular, he is interested in evidence of local place making and the global circulation of material goods. 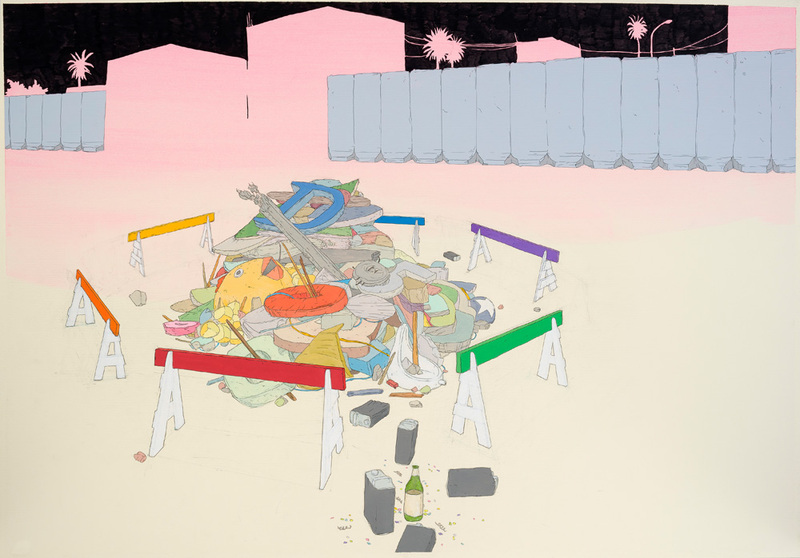 By collaging the source material within the drawing process, Emmons aims to present how the things we consume and build connect us to one another, to show the way everyday objects contain both histories & creative potential, and to make the familiar strange through proximity. Amze Emmons (b. 1974, Amsterdam, NY) is a Philadelphia-based, multi-disciplinary artist with a background in drawing and printmaking. Emmons received a BFA from Ohio Wesleyan University and a MA and MFA from the University of Iowa. He has held solo exhibitions at Park Life, San Francisco; Kesting Ray, New York; Space 1026, Philadelphia; OHT Gallery, Boston; and Works on Paper Gallery, Philadelphia. His work has been exhibited in group exhibitions including EFA Project Space and the International Print Center, New York; the Delaware Center for Contemporary Art, Wilmington; the Des Moines Art Center, Des Moines; Wendy Cooper Gallery, Chicago; and The Print Center, Philadelphia. Emmons has received numerous awards including a Fellowship in the Arts from the Independence Foundation; an Individual Creative Artist Fellowship from the Pennsylvania Arts Council; and a Fellowship at the MacDowell Colony. Amze Emmons (b. 1974, Amsterdam, NY) is a Philadelphia-based, multi-disciplinary artist with a background in drawing and printmaking. His images evoke a sense of magical/minimal realism inspired by architectural illustration, comic books, cartoon language, information graphics, news footage, consumer packaging, and instruction manuals. Emmons received a BFA from Ohio Wesleyan University and a MA and MFA from the University of Iowa.